WordPress is a free and open source web creation tool which is used for the powerful blogging and content management system. WordPress is easily customized with the help of themes. WordPress themes make websites SEO friendly and provide great control over the presentation of the material of website. These themes have the collection of pre-made templates, font styles, various free and easy to do features which enhance graphical interface for the incredible user experience. Javelin is the powerful, modern and highly responsive multipurpose WordPress theme. It has an extremely flexible framework to provide customization and a platform for the development of a broad spectrum of applications catering all sorts of fields and industries. It doesn’t require great command on coding as it has vast collection of demo websites and page templates. Uncode is a resourceful, responsive and multiuse theme. Uncode offers streamlined and modern website interface which results in superior browsing experience. Uncode has a flat design which focuses on practicality and efficiency. It provides artistic and creative freedom as it has many visually appealing features like CSS3 animations. Uncode is lightning fast and optimized for search engines. Kalium comes with awesome features and a great platform to be the most creative. It is one of the best minimal portfolio themes of WordPress. It is mostly used by designers to showcase their portfolios in the most creative and easy ways as there are hundreds of personalization options. It has a library of impressive templates, thousands of font styles and pre made portfolio layouts. Divi is considered to be as the most versatile theme offering aesthetic, modern, trendy and hip, visually attractive features which are mobile friendly, well-structured and multiconcept. All these characteristics make it 100 % customizable. With an amazing drag to down editor and ready to use layouts, it becomes very handy with beginners and professionals. 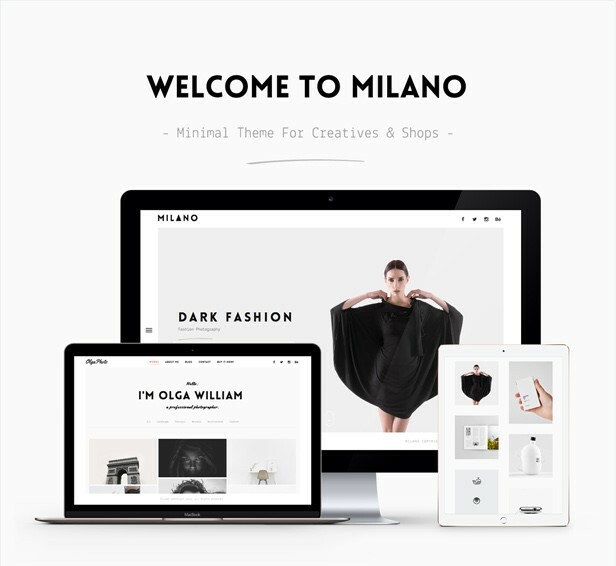 Milano is a creative portfolio theme which is considered the best to use for designers. Although it has only 10 pre-built website demos but they are not lacking any style, personality and features because all of these demo pages are expertly designed. Additional features like WooCommerce also give the option of selling products from your website. Charm is a sophisticated theme with an intuitive and deep sense of style which provides delightful experience of navigating through website. It is very clever and tech-savy as it has been coded with utmost efficiency. It incorporates necessary tools, formats and page templates which only need single line of code to make it. It has earned high scores in Google Page Speed tests because of its outstanding feature roster, great versatility in design and feature and perfect structure. It gives you two options between sliders that are Layer Slider and Slider Revolution which gives a good opportunity for the users of WordPress. High resolution Retina Displays enhance user’s experience of the display and content. It is the up to date and modern theme for interior design websites. It offers six homepage templates along with many templates for inner pages. Another main feature of this theme is the selection of 19 header layouts that are applied with just a click of button. These features enable users to custom the website using an off-shelf WordPress theme. With so many incredible tools and features, Inteco theme offers everything an interior designer wants to showcase.